The cold, wind and snow make working outside during the winter miserable. However, some landscaping work still needs to be done, in particular pruning. That’s why the Atlantic Maintenance Group has a guide detailing the important reasons to prune in the winter. The first of our reasons to prune in the winter is that the lack of leaves makes identifying limbs that need to be cut down, and cutting them down, a much easier job in the winter. When the tree’s full of leaves, it can be difficult to spot trouble branches. Those branches that are loose, diseased, broken, or are otherwise dangerous to the tree and your property are obscured during the spring, summer, and fall. However, with the all the leaves gone it’s much easier to spot limbs that can be a problem. The leaves gone also make it easier to get close enough to prune them. Another one of the reasons to prune in the winter is because it’s beneficial to the tree’s health. The first way it’s beneficial to the tree’s health is that in pruning you can target and remove limbs that are diseased, insect ridden, or broken that might harm the tree later. The second way that it improves the tree’s health is by making it more energy efficient. Tree’s are dormant in the winter and store their energy in their roots. Strategically pruning limbs that are diseased, dead, dying, overhang your home, or limbs that are wasteful, removes limbs that would wastefully take energy in the spring. This energy instead goes to spurring growth on the remaining limbs and in the direction you want the tree to grow. The best time to prune is in the late winter, while the tree is dormant, but its close enough to spring that you can ensure the wounds from pruning will be covered over with growth soon. The final of our reasons to prune in the winter, and perhaps the most important, is that it protects your property and family. 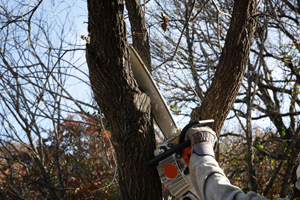 Pruning in general removes limbs that are potentially hazardous to the tree and the things around it. But in the winter the combination of cold, snow, ice, and heavy winds make trees especially dangerous to the people and property around them. The cold makes tree limb’s more brittle, the snow and ice add weight, and finally the wind blowing puts stress on the limbs. All of these factors can increase the chance of limbs breaking and falling on your house, if not the entire tree. Pruning should be done by professional arborists. Call The Atlantic Maintenance Group. The Atlantic Maintenance Group offers a wide variety of commercial tree services to help you keep your trees and shrubs beautiful and healthy. Our experienced arborists and Maryland certified tree experts can diagnose, remove and or treat the necessary problems to help protect your plants and help ensure safety on your property. If you’re unsure about what to prune, or would like a highly qualified professional to manage the task for you, put down those shears and call The Atlantic Maintenance Group at 410-768-4720 or contact us via our website today. This entry was posted on Friday, February 13th, 2015	at 11:16 pm	and is filed under Tree Care	. You can follow any responses to this entry through the RSS 2.0	feed. Both comments and pings are currently closed.